Bring on the bands! Ring on the bells! Dance in the Parades! Celebrons la Fete Nationale! Trouvons le coeur! As we all know, everything is better with FOOD! Since I am a FOODIE, feast your hungry eyes on lunch for Jini and John today! I feasted on my first artichoke in Paris in 1958 on a student trip. Students in France eat very well, nest-ce pas? These artichokes are educated artichokes. They are to be eaten cold, unlike most, and then each leaf is to be gingerly dipped in a special vinaigrette. It is one that is made with cream. Yes, I said cream. I hope my gourmet friend from the City of Brotherly Love is watching, for it is her recipe that tingles the tongue and sends up flags!! It propels the self-proclaimed gourmet foodie of the 21st century into flights of delight. Purchase the best and largest fresh artichokes possible for this first course recipe. 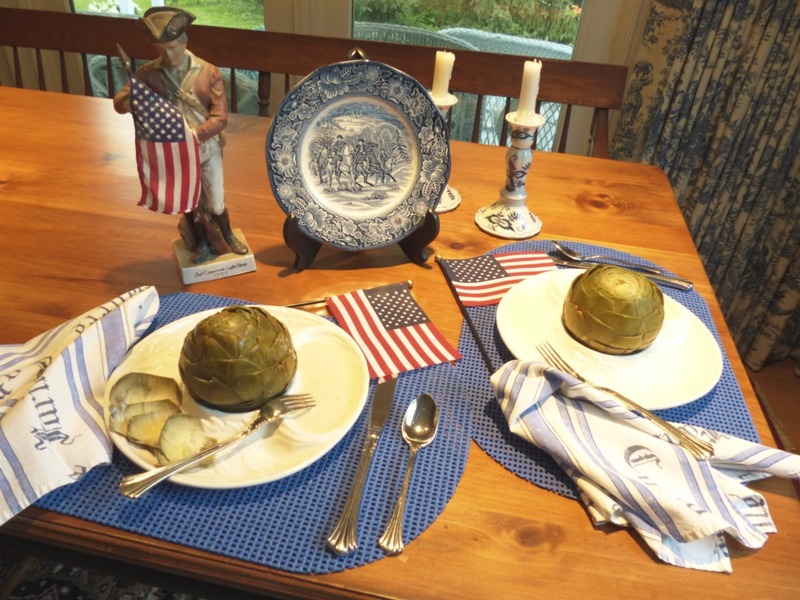 Make sure the artichoke leaves are green with no black ends or black stems. First, cut each stem so the artichoke will sit flat; then with scissors, cut each individual leaf point with barb, off. Next, place all artichokes in a large saucepan or in the sink filled salted water to cover them. You may need to use a heavy object to hold them under the water. This process brings out the bright green color and retains it. Drain after about ½ hour or more. Then place them in the large saucepan, fill it to about 2 inches with water and cover to bring to a boil. Steam them about 40 minutes or more depending on the size of the artichokes. To test, take a sharp knife and pierce the bottom of one to see if the knife goes in easily. When it does, remove them to drain upside down and to cool. They may be kept in the fridge in Ziploc bags for one or two days (more if necessary) until ready to serve. They will be served COLD as a first course with the French Vinaigrette recipe below. Rave review will follow! Add ½ cup light cream or half and half and shake. Chill for a few hours in the fridge.